He was an excellent carpenter and could build anything to perfection. He ran a dairy for many years. He believed in hard work and could out work anyone young or old. He married Gloria Rigby on May 19, 1953 and for the next 50 years they spent their life together raising nine children, moving all over God’s green earth, and pulling together. Gloria died on September 12, 2003. On May 26, 2007, he married Mary S. Ingalls and they spent the last 12 years enjoying life together in their golden years. He is survived by his wife, Mary; Children, Kurtis (Judy) Nelson, Preston, ID, Becky Jo Nelson, Logan, UT, Randall (Tami) Nelson, Mesa, AZ, Suzanne (Kipp) Norman, Preston, ID, Jeffrey (Terry) Nelson, Elko, NV, Michael (Dorothy) Nelson, Lyman, WY, Daniel (Carissa) Nelson, Columbus, IN, Melissa (Pernell) Cleverley, Elko, NV. 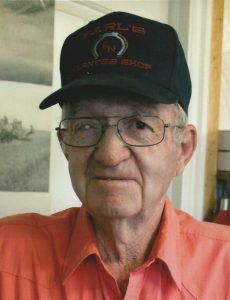 Phil Kent (son-in-law), Richfield, ID. His step-children: Jim Shaffer, Logan, UT, Kathleen (Marvin) Bunderson, Brigham City, UT, Joanne (Kirt) Nylander, Calis Sierra Madre, Claire (Jerald) Jeppeson, Aloha, OR, Keith (Theresa) Gabel, Ogden, UT, and Michelle Morgan, Eugene, OR. He is also survived by a brother, Reed Nelson; and sisters, Lois Woodward and Carol Jean Smith. Between he and Mary there are 71 grandchildren, 102 great-grandchildren, and 2 great-great-grandchildren. He was preceded in death by his wife, Gloria, two daughters, Vickie Kent and Heidi Nelson, 3 brothers and 2 sisters. Earl lived a rich and full life full of many amazing experiences. He had a great sense of humor and entertained us constantly with his songs of nonsense, stories and poems. He could talk like Donald Duck and entertained us many times with this talent. He loved his family and was proud of each and every one of them and made them all feel important and loved. His grandchildren and great-grandchildren deeply loved and admired him.